Near new house in a quiet street. Decent sized house and rooms with a backyard. Fans in the bedrooms air conditioning in the dining/lounge. House is fully furnished but the bedroom is unfurnished. Internet is included in the rent. Beautiful 4 bedroom house, organising internet at the moment. Super easy location close to M1 and Pimpama Junction, on a quiet street. Very quiet place. The room is aircon. Own bathroom. Its up stairs. My down .its a clean and tidy place. Its a duplex so only one neighbor. 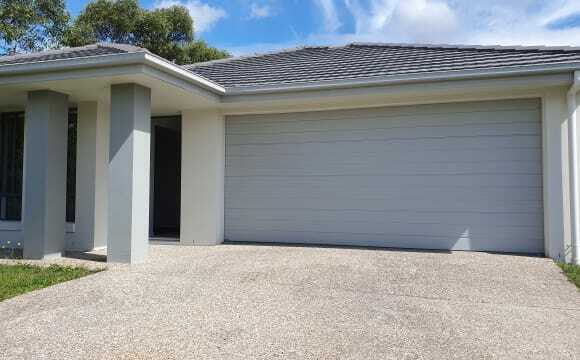 This BRAND NEW 4 bed family home located in a really nice area of Pimpama. It's a new estate with lovely neighbours. The property offers low maintenance living with a breezy, open plan design and light, bright, modern interiors. With a family friendly floorplan and a large modern kitchen that has convenient sliding door access to the rear patio. 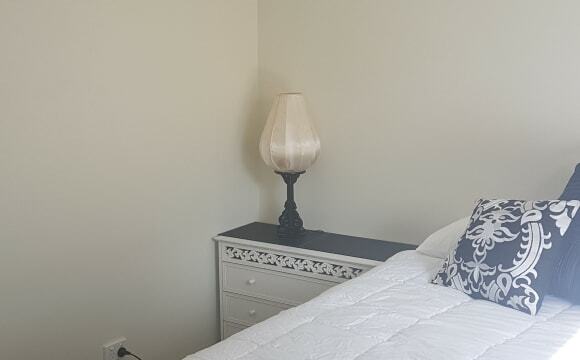 Situated in a quiet classy street conveniently close to the M1 south &amp; north bound (quick access, no major traffic lineups for the freeway), 3mins from Ormeau train station as well as 3 of the major theme parks, shopping centres &amp; parklands. Property Features: - FULL SECURITY - Open plan tiled living areas - Air conditioned lounge - Ceiling fans in all bedrooms - Main bathroom with large bath and separate shower - Separate toilet to main bathroom - Carpeted bedrooms, tiled kitchen and dining area - Stylish kitchen with stainless steel appliances - Dishwasher, electric cook top - Covered rear entertaining patio - Fully fenced yard with landscaped garden beds and a double lock up garage Bed 1 - $180pw + utilities Bedroom + share 4th bedroom for storage/study, large garage storage cupboard to share, garage space Bed 2 - $160pw + utilities Bedroom + share 4th bedroom for storage/study, large garage storage cupboard to share, easy on-street parking Option 3 - Two rooms. Own bathroom &amp; share with one female only. Own private space at opposite end of the house. Garage space. Must love animals as I have two small well behaved dogs 😊 Female household only. No couples. Must be working full-time. This property is only a couple of years old, it is modern, sophisticated, and spacious. It is in prime location being just two minutes from Gold Coast/Brisbane highway and Ormeau train station, as well as having the new pimpama city shopping centre across the road. It has internet (split bill if required), air conditioning, a fairly big backyard, and plenty of car space. The correct address is not coming up when I try to list it, as it is a new estate, so please message me for those details if required. The photos I have added are the private bathroom/toilet/room available, you would be able to have two of the four rooms if you needed! Will provide more photos upon request. I also live with two very cute white fluffy puppies - maltese shih tzu. If you would like to inspect, please just shoot me a message, I am very flexible with times. Pets are considered, however large dogs will need to be outside dogs. The house is a duplex and is located in a quiet area of Pimpama. Furnished own bathroom with shared bathroom for rent! Modern 4 bedroom house with lots of space, nice flatmates and on-street parking. Really simple household with minimal stuffs there (just moved in) House located at The Heights Estate 2 minutes to Commera Square with Coles, Aldi and much more. *The address listed is actually incorrect, as this estate is so new it wasn't registering my street sorry. We live at The Heights Estate in Pimpama. We live just off the M1 so really easy access to go either to Brisbane or in to Surfers Paradise etc. We live just down the road from Dreamworld and White Waterworld. It takes about 15mins to drive to Logan, 30mins to drive in to Brisbane, 30mins to drive to Broadbeach and Robina etc. Its a very quiet place. Just me and my dog (bob).its clean and tidy. And the room is up stairs and its own bathroom. 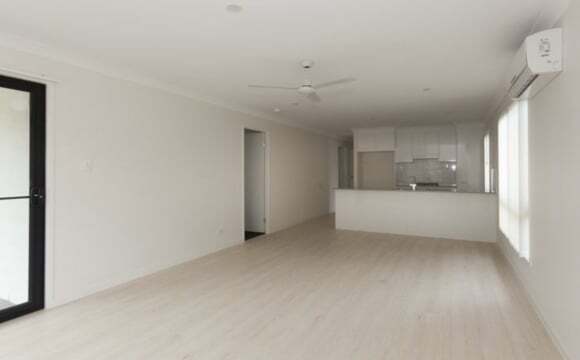 A brand new 3 bedroom, 2 bathroom Duplex in Pimpama. A clean and relaxed home which includes, fans, air con, new comfy lounge with a 55 inch tv screen, nice kitchen and dishwasher. A relaxing small patio and bbq a the back. Sharing with just myself. Within 2 minute drive and 5 min walk you have all the shops you need, Coles, Aldi, chemist, New tavern, cute cafe, petrol station etc. bus station within 1 km and Coomera and ormeau stations was that 10 mom drive. 2 minute drive to get to the highways and we are Half way to Brisbane and Gold coast. It's a brand new house, has a decent size backyard with a new 12ft trampoline. It's extremely close to the new Westfield at Coomera, many State and Private schools and nearly all of the theme parks on the Gold Coast. Only 15mins north to the Logan Hyperdome and close to half an hour south to Robina and Pacific Fair Shopping centres. Its very stylish and easy going, we have Netflix and an outside area for pets. We are barely ever home but we are very friendly and would love to get to know you! 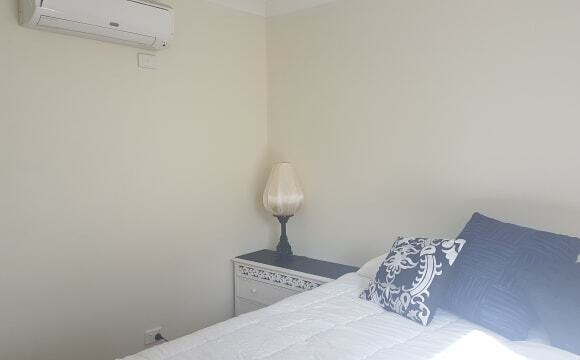 We have a room for rent in a newish 4 bedroom fully airconditioned house, located in great new estate in Pimpama. Close to M1. 5 minute drive to Ormeau or Coomera train stations. 2 min drive to local shops (woolies/BWS/takeaways/Gym). You will share the bathroom with one other housemate, the bathroom has a large shower (and spa bath!). Bedroom has a large closet across one wall, has built in shelves. Room has been furnished with a bed but can remove if required. Looking for someone who is in permanent employment and who is clean and tidy and doesn't mind pitching in and helping out with the normal routine housework. Bills and internet are included in the rent, however you would need to do your own grocery shopping. 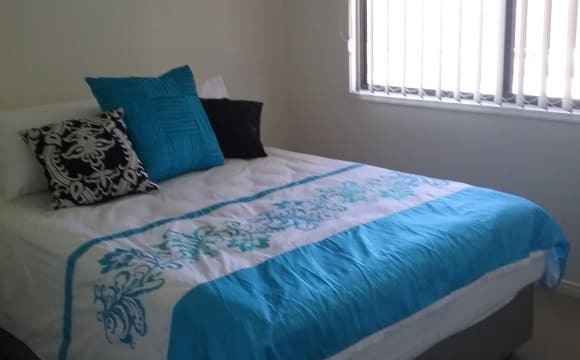 we live in a quiet area good neighbors , close to pimpama city development close to bus rout . fans in all rooms , balcony off room built in wardrobes air con in main living area, dish washer small yard little maintenance , clean honest . a little cluttered but easy fix. if wish rental history you can be put onto lease. its three lvls , bottom garage laundry middle lounge kitchen bedroom top two bedrooms bathrooms a lock up area next to garage is cloths line and water tank , a mate has stored his motor bike there with out issues. I would ask smoker to not smoke inside. I live in in the Pimpama and have a 4 bedroom house I am currently renting. One room is being used as my study and the other is a guest room but at the front of the house is a large bedroom with BIR and ceiling fan and right next to it is a large private bathroom. As well as that there’s also a space in the carport for your car or extra storage if needed :) There is a split system air conditioner in the living area, gas stove, I have a washing machine and dishwasher and all the kitchen and lounge/ dining room furnishings. The house is close (walking distance) to nearby shops, petrol station, takeaway food places and only a 10minute drive to two Westfield Shopping Centres and public transport. The house has a fully fenced back yard and would be suitable for pets, I have had 2 cats here previously and the property managers are pretty easy to get along with so I'm sure there won't be any issues there. 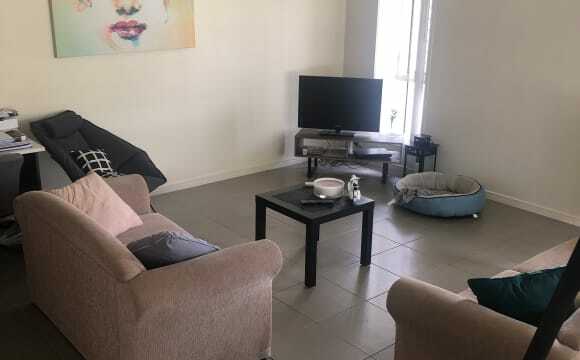 Netflix, water, NBN high speed Internet, aircon in living area, gas included plus undercover garage parking for one car. Address is actually 23 Kinglake Crescent. This place is close to everything you need. Coomera town centre, train station, supermarkets, fast food etc Photos were taken a while back, but still in similar condition, the house is still quite new. This is a 4 bedroom two storey unit. Living area and main bedroom with ensuite is upstairs. There are three bedrooms, bathroom, laundry and courtyard on the ground level. The rooms on offer are on the ground floor. We are close to shops and amenities and the new Coomera Westfield is at the next exit. Main living area is air conditioned. Unit is very cool. Nice quiet area. Bushland across the road. It's a lovely clean place.The room has its own bathroom, And AIR CONDITIONER the room is up stairs private . Close to the M1. . .rent includes bills.. Room available after 31,3,2019. Close to shops. Public transport. 45 minutes from Brisbane, 15 minutes to Surfers Paradise. Really good neighborhood. Great neighbours. All watch out for each other. And it's a nice street. Owner occupied houses mainly. All working etc. Normal decent stuff.